I love good values and great food. Hence, whenever I can find a large quantity of quality food at a good value I'm all over it. What often happens is that I find myself at an all-u-can-eat situation where I afford myself very little restraint. When I say little restraint, what I really mean is no restraint. Some years ago I found myself at Tony Roma's during their "endless slab" special that featured all-u-can-eat St. Louis ribs. � an onion loaf, Caesar dinner salad, and 56 ribs later a teenage boy at the table next to me asked for my autograph on a napkin after witnessing such a gluttonous feat. In high school I found myself in Boise at a JB's Restaurant where our soccer team was eating breakfast prior to playing in the second round of the state soccer tournament. 18 large pancakes later my waitress was accusing me of slipping pancakes to my teammates and taking advantage of the all-u-can-eat special they were offering. If only she had witnessed me eat 22 pancakes at a basketball camp earlier that summer she probably would have held her tongue and just shook her head in amazement. So what does that have to do with golf? Well, when I'm on a golf trip where I can save money by playing quality courses at a great value I find myself splurging at dinner on a large quantity of great food. And when it comes to "value" golf there are two places out here in the West that are as good as any place in the country; Salt Lake City and Spokane. I define value golf as quality 18 hole golf courses that charge less than $30 for a full round of golf. Not only do Salt Lake and Spokane offer great value golf, they each boast two of my favorite places to eat anywhere; Rodizio's and Wolf Lodge. Late at night when I'm craving something to eat I find myself watching The Food Channel. One of the shows I occasionally watch is "Throwdown! with Bobby Flay" which features the famous chef challenging amateur chefs across the country in a contest of cooking an amateur chef's most famous food creation. Judges are then brought in to rate the final product in a handful of categories to determine the winner. So we're going to have ourselves a good ol' fashioned throwdown as well in an effort to determine which city offers the best value golf experience. We will compare each city's offerings in the following categories: Most Famous Course, Best Housing Development Course, Most Famous Architect Course, and the Best Overall Course. 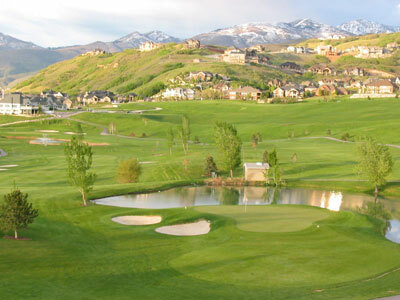 The Wasatch Front's most famous course is Bountiful Ridge ($24 all week) located just north of Salt Lake. Bountiful Ridge received national attention when Idaho State University alum Bruce Carver formed Access Software and invented the Links PC game that included Bountiful in its library of courses. The residents of Bountiful often consider "The Ridge" their own country club, and with good reason considering the quality layout, stunning views, and the finest conditioned greens I've found at a municipal course. While players are sure to lose some balls in the scrub oak that is featured throughout the course, it is critical to have at least one ball left to tackle the signature 18th hole. A very reachable par five at only 485 yards from the tips, Bountiful's finishing hole plays across a deep swell in the fairway to a green perched into a hill that features a waterfall cascading down from the clubhouse and along the right side of the hole. Spokane counter punches with the historic Indian Canyon golf course ($25 weekday/$27 weekend) that opened for play in 1935. Indian Canyon has a rich history that includes hosting the USGA three times when it welcomed the field playing in the 1941 and 1984 United States Amateur Public Links Championship as well as the 1989 United States Women's Amateur Public Links Championship. The course is lined with towering pine trees throughout and drops 240 feet from the top to the bottom of the course. A good chunk of that vertical drop is felt right off the bat at Indian Canyon's signature opening hole that affords views across Spokane and gives golfers an excellent chance to start their round with a birdie with this par five measuring just 479 yards. In a battle that is as close as it gets, my personal rankings list has Indian Canyon located a single spot above Bountiful Ridge and hence Spokane takes the early lead for best value city in the West. Courses that run through housing developments are rarely appreciated by golfers, but remember, Pebble Beach is a housing development course too. While Salt Lake has nothing close to competing with Pebble Beach, you can play the 1994 Keith Foster designed Eaglewood Golf Course in North Salt Lake ($24 weekday/$26 weekend) for $470 less than Pebble. Keith Foster's portfolio includes designing the popular Coral Canyon course near St. George as well as being retained by Colonial Country Club in Fort Worth since 1997 to develop a master plan for course improvements that carried over into a renovation of the long time PGA Tour host course. Eaglewood's layout rests on a mountain over 5,000 feet above sea level and does an excellent job of keeping the nearby housing mostly out of play. The signature hole at Eaglewood is nicknamed "Hangtime" and is a 159 yard par 3 that plays significantly downhill to a green that is wrapped on both sides and back by a pond and is fronted by a pair of bunkers. At 6772 yards and playing to a par 71, Eaglewood is a solid challenge and excellent value. Spokane answers the call of Best Housing Development Course with the county owned Meadowwood Golf Course ($23.01 all week). Designed by Robert Muir Graves and opened in 1987, Meadowwood is one of three courses affordable courses owned by Spokane County. The relatively young course plays more like a links course now but given some years will more often be referred to as a parkland course as the young trees mature. Water comes into play on a majority of the back nine holes but none is more challenging than the 607 yard 16th. This lengthy par five features water down the right side of the hole early on before dissolving out of play and yielding to length and elevation as the real challenges of the hole. Playing uphill the whole way home, this hole is a true 3-shotter that features a minimum one-club hill climb to reach the green from just over 100 yards out. In another close battle, Meadowwood eeks out a victory over Eaglewood and gives Spokane a 2-0 lead. It is generally difficult to keep green fees low when a famous architect like Jack Nicklaus or Tom Fazio is hired. However, there are still some relatively famous architects that can work within a tight budget and produce a great product. 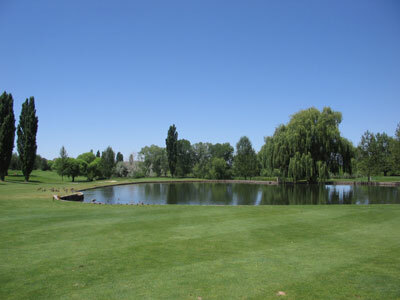 In Salt Lake that offering is the Wingpointe Golf Course ($27 all week) designed by renowned architect Arthur Hills. Arthur Hills will always hold a special place in my golfing heart since it was his beautiful Golf Club of Georgia layout north of Atlanta that was my first exposure to a world class golf course, conditions, and experience. In fact, that course won the Golf Digest award for Best New Private Course in the country in 1991. Wingpointe is located right next to the Salt Lake Airport and features a true links/wetland layout. With water coming into play on 12 of the holes and the tips stretching out to over 7,100 yards, Wingpointe is one of the most challenging courses in Utah. In the famous architect category Spokane counters with another county owned track in the Bob Baldock designed Hangman Valley Golf Course ($22 all week). Bob Baldock has a lengthy portfolio that includes Crane Creek in Boise and the famous Monterey Peninsula Country Club (Shore) in Pebble Beach, CA. A local favorite for many Spokane residents, Hangman's most talked about feature is the pair of 600+ yard par fives the course features. The 625 yard 5th hole plays downhill and wraps down to the left and requires two long shots to even have a legitimate look at the green for your third shot. Hangman Creek winds through the course but the most talked about water feature is the driving range where patrons hit floating golf balls to the large pond (As a side note, Meadowwood also features a lake for a driving range). Although both courses are very different, they are both great value tracks. But in a barn burner Wingpointe finally gets Salt Lake on the scoreboard with a victory. In the most important category of all, Valley View ($24 weekday/$28 weekend) represents the Salt Lake area for the Best Overall Value Course. Valley View is located in Layton about 20 miles north of Salt Lake and was designed by Bill Hall is 1974. Though you drive through a mature housing development on the way to the course, there are no homes on this pretty course. Mature trees and elevation changes are featured throughout the layout and excellent conditioning is always found. The opening hole is an excellent way to start the round with a 447 yard dogleg left where a monster drive could be gambled over the pond that protects the inside of the dogleg and leave the player with a short pitch to the green. 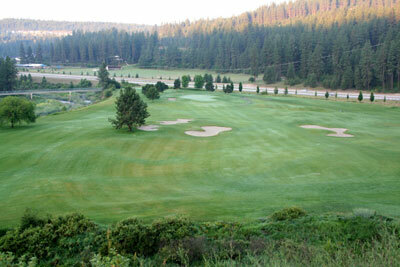 Spokane's answer to Valley View is their newest city owned course; The Creek at Qualchan ($23 weekday/$27 weekend). I love Qualchan! It is the best course under $30 I'm aware of. The opening hole features a towering tee shot off a cliff that drops nearly 100 feet to the fairway below. In addition to elevation changes, the course features a balanced mix of water hazards, tree placement, and hole shapes/lengths. I could pick a half dozen holes as the signature, but the hole most people will remember is the unique 18th. Just 504 yards from the tips, don't let the length fool you on this par five that features a generous landing area off the tee. The approach shot over a creek plays 20 yards longer than the actual yardage due to the extreme uphill climb needed to reach the green protected by a pair of deep bunkers. Once you are on the green there is no guarantee you'll be two-putting due the depth and subtle undulations of the green. With Qualchan winning its battle it vaults Spokane to a 3-1 victory over Salt Lake as the best value golf city in the West. What about the food you say? Well that is an even tougher decision. Salt Lake offers Rodizio's Brazilian Grill where several servers scurry around the restaurant serving about 15 different fire grilled meats to patrons that want to indulge in a meal that would make any vegetarian squeamish. The food is fantastic and the portions are endless. Spokane's final answer to Salt Lake is with the best steakhouse in the country; Wolf Lodge. Located at the southern tip of Lake Coeur d'Alene, Wolf Lodge serves the tastiest, most succulent steak I've ever had the privilege of sinking my teeth into. So what do you order when you get there? That's a no-brainer. You order "The Rancher." The Rancher is served with a side salad, side of beans, order of potato logs, a 20 oz. sirloin steak AND a 24 oz. porterhouse steak. Nearly three pounds of the best tasting meat in the country! Too much you say? I don't think so. I've devoured that entire meal four times on my own already and can hardly wait to do it again. See you on the links and then at the dinner table! Want to see more photos of The Creek at Qualchan and Indian Canyon? 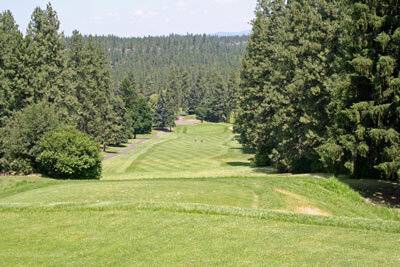 Click on the link to go to our Washington Golf Course Photos section.